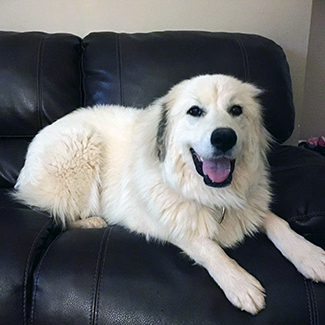 Hi everyone, my name is Bailey S. I am a gorgeous 2 year old girl and weight 75. I am new to GPRA and I am ready to join a family that will spend time with me and show me the world. I grew up in a loving family and had great childhood memories but they all started to change when the families child started showing symptoms of being allergic to me. We all tried to find a way for this to work and allow me to stay with my family, but it was decided that they could not allow me to be inside anymore. They knew I was unhappy and wanted to be with the family. That’s when they decided that I needed to find another family that would be able to give me what I wanted. I am a average energy kind of gal that does like to be with my humans. I am good with other dogs as long as they are not too aggressive with me and I just love kiddos. I will most enjoy taking new adventures with my family and exploring the unknown. Do I sound like the PYRfect girl to you? Then contact GPRA today at info@greatpyratlanta.com.